Handblown into original 19th century mould. Following early American traditions, a pontil rod is attached to the bottom so that the neck and flange can be finished, making each piece unique. As the pontil rod is broken away, it leaves an irregular bottom surface found on many antique bottles. Each lead crystal reproduction is drilled with a diamond tapered bit and fitted with a polished nickel-plated stopper (solid brass) in the shape of a cork. Period bottles were stoppered with corks. Handcut pair of quills of the finest quality will vary in color and shape. 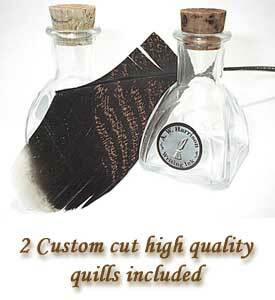 Package of 5 expertly cut quills includes prized varieties such as Bronze or Royal Palm turkey and goose quills. quills by cutting across for italic or angled for oblique nibs. To return packaged quills to natural shape, gently steam over kettle for a few seconds.